...every white tiger in the U.S. is not only the result of repeated inbreeding of genetically defective animals but, even worse, is a hybrid or crossbred animal. This photo illustrates the facial deformities that typically accompany the white gene. You never see these "throw-away" cats on display in zoos. It is those offspring which have been disseminated throughout the U.S. One of the individuals who owned the litter of five brothers and sisters representing the American crossbred white tiger bloodline has continued to inbreed his tigers for over the past twenty-five years even though his neonate mortality rate has often exceeded eighty per cent and his tigers are severely defective and unfit. By pure chance and against overwhelming odds, when the two separate bloodlines, the Indian and American, were crossed for the first and only time at the Cincinnati Zoo, the offspring were fairly thrifty and of normal birth weight. This was the normal course of natural selection and evolution of the tiger until a young white tiger male was captured in 1951, raised and then inbred to one of his daughters by a Maharajah in India who had captured him. Then, in the early 1970's, the recessive genetic mutation for the white color was present in both the male Siberian tiger and the female Bengal tiger that were exhibited and bred at the small zoo in South Dakota resulting in the origin of the American white tiger bloodline. To quote from Dr. Ron Tilson, Conservation Director of the Minnesota Zoo, "The white tiger controversy among zoos is a small part ethics and a large part economics. The tiger Species Survival Plan has condemned breeding white tigers because of their mixed ancestry, most have been hybridized with other subspecies and are of unknown lineage, and because they serve no conservation purpose. Owners of white tigers say they are popular exhibit animals and increase zoo attendance and revenues as well. The same rationalization can be applied to the selective propagation of white lions, king cheetahs and other phenotypically aberrant animals." "However, there is an unspoken issue that shames the very integrity of zoos, their alleged conservation programs and their message to the visiting public. To produce white tigers or any other phenotypic curiosity, directors of zoos and other facilities must continuously inbreed father to daughter and father to granddaughter and so on. At issue is a contradiction of fundamental genetic principles upon which all Species Survival Plans for endangered species in captivity are based. White tigers are an aberration artificially bred and proliferated by some zoos, private breeders and a few circuses who do so for economic rather than conservation reasons." Dr. Tilson made these comments before I informed him that all the white tigers in the U.S. are crossbred or hybrid animals, part Siberian and part Bengal. 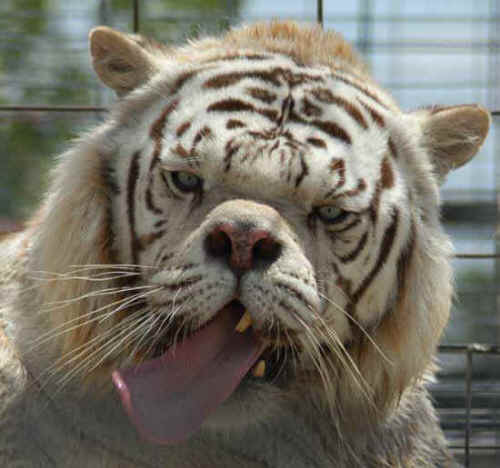 So, in conclusion, every white tiger in the U.S. is not only the result of repeated inbreeding of genetically defective animals but, even worse, is a hybrid or crossbred animal. Thus, anyone involved in breeding and/or exhibiting white tigers is doing a great disservice to honest conservation and preservation efforts to save the five remaining and endangered subspecies of tigers barely clinging to survival in their rapidly diminishing natural habitats. The genealogical misrepresentation, repeated inbreeding, exhibition and sale, for $60,000 each, of white tigers by the Cincinnati Zoo initiated the greatest conservation deception of the American public in history. That deception continues through today. In my view, exhibiting and breeding white tigers is the very antithesis of conservation, is dishonest and unethical and is tantamount to catering to the public's desire to see genetic aberrations rather than educating the public regarding the incredible process of natural selection, how the unbelievable diversity of life has evolved on our planet throughout the past 50 million years and the crucial need for us to preserve natural habitats and stop the destruction of our global ecosystem if we desire to save any threatened or endangered species from extinction. Dr. Laughlin is widely recognized internationally for his expertise in the care and management of zoological animals, especially zoological cats and elephants. He has an international consulting practice limited to zoological animals and when he completed his research into the accurate genealogy of the white tiger he had well over 250 tigers in his practice alone.